Californians need to drive less. Period. California has for years—since the passage of S.B. 375 in 2008, and even before that, with Regional Blueprint Strategies—sought ways to reduce greenhouse gas emissions by planning for housing, jobs, services, and transportation in ways that allow people to drive less. At least, that was officially how it was supposed to work. S.B. 375 required regions to add “Sustainable Communities Strategies” (SCS) to their regional transportation plans. An SCS is supposed to lay out what regions—and the cities and counties in them—would do to help reduce the need to drive everywhere. All the regions have these plans now: they say they will build more housing near transit, invest in better transit, and improve conditions for people walking and biking. But S.B. 375 only required that these plans to be written and approved. There were no enforcement measures, and until last year’s S.B. 150 there wasn’t even a requirement that progress be measured. The first S.B. 150 report was released today, and it is not good news. California regions are not on track to meet their greenhouse gas emissions targets, not by 2035, and not even the “easier” targets in 2020. Other reports have announced that California will meet its 2020 targets, but those emission reductions are almost entirely from cleaning up the electricity sector, specifically because of an increase in hydroelectricity made possible by heavy rains in the past few years. Emissions in the transportation sector, in contrast, are rising, even with cleaner fuels and more electric vehicles. The S.B. 150 report, pulled together by Air Resources Board (ARB) staff and based on data from regional agencies, shows that Californians are driving more, everywhere, per capita and over all.The report also finds that despite the existence of the SCS plans, regions are not investing enough in either climate-friendly transportation modes nor affordable homes near jobs and transit. While positive gains have been made to improve the alignment of transportation, land use, and housing policies with state goals, the data suggest that more and accelerated action is critical for public health, equity, economic, and climate success…. 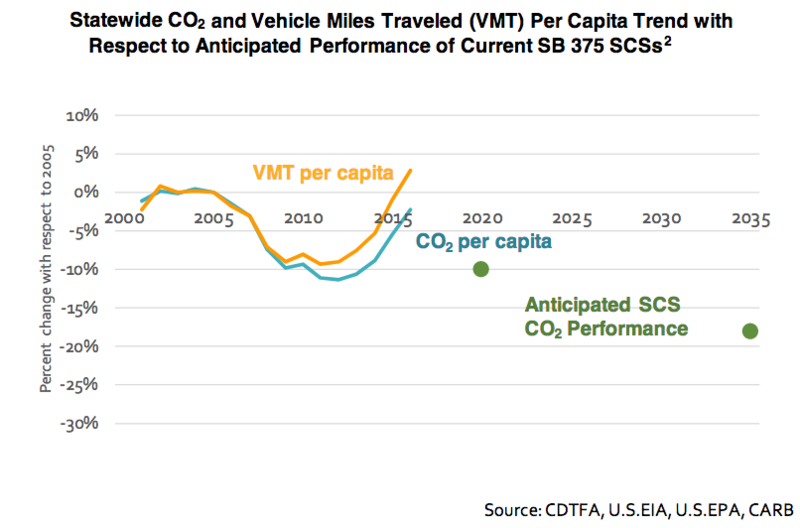 California will not achieve the necessary greenhouse gas emissions reductions to meet mandates for 2030 and beyond without significant changes to how communities and transportation systems are planned, funded, and built. The targets are set by law—S.B. 32—and ARB works with the regions to set attainable goals for each. At every update to the state scoping plans, the regional governments—in Southern California, in the Bay Area, in Sacramento, in the Central Valley—have fought for easier emission reduction targets, claiming there are too many factors outside of their control that prevent them from meeting more stringent targets. It’s true that there are many challenges to this project, and the report discusses them in detail. There isn’t enough housing being built of any kind, let alone the high-density, transit-adjacent kind. The report finds that while compact growth is increasing in California, so is urban sprawl. There is only so much a regional planning agency can do. They control some transportation funding, but not all. They have the ability to create a few incentives or discourage bad planning because they make some transportation funding decisions, but most land use planning remains firmly within local control. But there are some factors within the control of planning agencies that have perhaps been overlooked. While they have been busy creating strategic plans to encourage environmentally-friendly transportation, those same regions, cities, and counties have continued to invest in building new highways and expanding existing ones. Meanwhile many of the strategies in the regional Sustainable Communities Strategies have remained on paper, unfunded, and at the bottom of transportation priorities lists. This report is dour enough news, but it comes on the heels of the Fourth National Climate Assessment from the federal government. That report, released on Friday and immediately downplayed by the Trump administration, says climate change will bring dire consequences to the economy, environment, and people’s health, even in a best-case scenario in which California’s efforts pay off. S.B. 150 was written to bring accountability to one of California’s signature climate change efforts, the move to plan transportation and land use for better, more livable communities. This first report shows all the planning has not been enough. Major shifts in priorities will be needed, to shift money and investments away from car infrastructure and towards better, more frequent, more extensive transit options. The state’s current structure of policies and lack of incentives will continue to produce and exacerbate the insufficient results outlined in this report unless shared responsibility, changes in authority or mandates and incentives, and strong, deliberate, collaborative action is taken by state, regional, and local policymakers to foster a policy environment that enhances the way we live, work, and travel. “We know what to do; we just have to make it easier for people to get around by biking and walking and taking transit,” said Wise. The report will be formally discussed at the second joint meeting of the Air Resources Board and the California Transportation Commission (CTC) on December 4 in Los Angeles. The CTC is in charge of allocating money for transportation projects in California, so this will be a new opportunity to discuss the importance of shifting state resources towards investments that encourage sustainable transportation choices. Written comments on the report can be submitted to ctc[at]catc.ca.gov by 10 a.m. December 3. @Kevin Withers – “War on cars” is another right-wing catchphrase, although it’s not as rhymeful as “stack ‘n’ pack.” This time you’re quoting a coinage of the highway lobby. What do you think was the result? It’s something older folks have a hard time wrapping their minds around. It’s already “after the fact”. It’s not a binary choice. Transportation will evolve, but the juvenile, SB “war-on-cars” generates the same results as banging ones head on a brick wall. Have fun. Yeah, but a lot of it is largely theoretical. Besides, three possible problems with extracting carbon from the atmosphere. 1. Where does carbon extraction stop and who decides? When it reaches net-zero? Or will those who presumably will have invested small fortunes in decarbonizing schemes insist or continuing carbon extraction? Perhaps going beyond leading to global cooling? I mean how far is this going to go? 2. Next, what about all of those other pollutants (e.g. toxic, criteria and other greenhouse gas pollutants, gases like methane, the fluoronated gases, nitrous oxide and sulfur hexafluoride) released from fossil-fuel-burning processes? Do we exclude all of those to focus only on carbon extraction? 3. And, finally, how much of an impact can carbon extraction make when gigatons of carbon emissions are released from fossil-fuel burning into the atmosphere yearly? It is better to focus on ways of preventing the release of emissions rather than addressing the problem after-the-fact. Uh, oh, huh, gee whiz. Carbon extraction is a thing. Denser cities are a relatively new living arrangement for homo sapiens, which spent millennia living as roaming hunter / gatherers and then dispersed farmers. Protection from invaders, trade, manufacturing and industrialization brought people together in villages, towns and cities. Technological benefits of electricity, natural gas, clean water and sewage treatment were easier to provide to concentrated groups of people versus dispersed farms. However high rise apartments or condominiums are relatively recent, at most the last 100 to 125 years. Now technology of distributed energy resources, telecommuting, IIoT, IoT and automated manufacturing is not requiring that people be crowded together, so people natural want to have the space and openness of suburban or rural lifestyles versus congested high rise inter-cities. Do you see Malibu residence, rural / suburbs, moving in droves to Century City, urban / high rises? NO! Do you see Beverly Hills mansion residence selling and moving into high rise apartments or condominiums? NO! The wealthy will keep their suburban and rural spacious living, while the middle class and poor are herded into compact living spaces for the sake of the environment. “Carbon-extraction,” uh, no. “De-fossilization,” while it won’t be impossible, it will, however, be difficult as this is contingent on changing behaviors, especially in the transportation and travel sectors. You know there is a problem when the reward for reducing toxic, criteria and greenhouse gas emissions is to receive funding to build new or expand existing highways. Go figure! 😉 In any case, yimbys grabbed onto the stack and pack agenda and are promoting it as gospel. Go figure. Let them stay in the suburbs. Building denser housing doesn’t kill suburbs. @Kevin Withers – “Stack ‘n’ Pack” was popularized by Glenn Beck while he was at Fox News, as part of fomenting against the U.N.’s Agenda 21 with an insane conspiracy theory. Apparently it has impressed people who imagine themselves to be progressive yet are susceptible to things that rhyme. It’s been tossed around so wide and often that the term nimby has become redundant. Everyone should care about their city/neighborhood. Period. EVs are indeed part of the solution. It will happen through the market. Not through Sacramento. But you do sound like a typical NIMBY. Many of those consider themselves to be progressives, just not on this particular item. But buck up. Even the car manufacturers think that EVs are the future. They plan to end production of ICE powered cars in one or two decades because they will cost more than EVs and the consumer in these situations is king. And what are the penalties for not meeting the goals? If there are no penalties, the goals will not be met. No one will put up with draconian measures. I predict that the goals are reduced or the deadlines are moved to the 2040s. Try getting out of your bubble occasionally. Right wing extremist? I’ve never voted for a Republican in my life. You give yourself away when you try to stereotype people into preconceived categories. You give yourself away when you say “stack and pack housing” – a phrase commonly used by right-wing extremists. In reality, Californians are members of the species Homo sapiens, like people all over the world who live in denser cities – which means we do not have an inborn, genetic aversion to living in denser cities. Make “plans”. Set “goals”. That’s what legislators in California like to do. In the 10 years between 2008 & 2018, did anyone really expect a paradigm shift? Without the full support of the population, little will change. You cannot legislate society and/or lifestyles. The SB375 and AB32/SB32 bills never had popular support, despite the religious fanaticism of Jerry Brown. They were passed because they were “goals” and not requirements. Until now regional planning agencies only had to name some strategies and show the math on why they think those strategies would reduce greenhouse gas emissions. S.B. 150 aligns local and regional greenhouse gas reduction targets with state targets, creates a community-driven process on how to measure progress, and requires regular reports on progress, success--and challenges met along the way. After 2020 California GHG emission reduction goals will become more stringent, and therefore harder to reach. Since transportation is the largest single contributor to GHG emissions, achieving targets requires finding ways to make it easy for people to drive less. But regions say they can't control driving, and they don't have enough money.